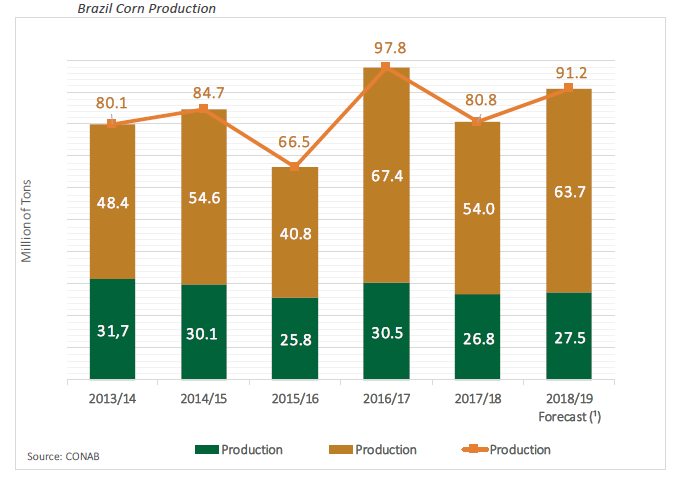 The Brazilian production of corn is the third largest in the world with increases in productivity over the last 10 harvests of 6.8% per year. The area of corn grown in the 2nd crop is 62% of the area and 65% of national production. This evolution is possible because of the introduction of production technologies for tropical climates. SLC Agrícola plays a key role in this process, being recognized with the achievement trophy in corn production for more than 10 years. Corn is the energy base of the food for poultry, porks and cattle, and is also intended for human consumption. Corn has a fundamental role for our crop rotation, because it produces a large amount of husk that helps protect the soil, recycling nutrients and increasing the organic matter in the soil. Corn is part of the planning due to its agronomical benefits and it rotates with soybeans and cotton. It plays a key role in the dilution of fixed costs of farms, especially where it is grown as a 2nd harvest in the states of MT, MS and MA. The planning for supplies takes into account the expected production for each planting season, in order to obtain the best cost/benefit, and decisions on the hybrids to be planted is based on our research database and according to the biotechnologies identified as being necessary for the production system. The direct planting system represents 100% of the area cultivated with SLC Agrícola corn, which is planted immediately after the soybean harvest. The management strategies realized in corn depend on the expected production for each plantation and on the monitoring of pests and diseases (IPM/MID), which allows to direct efforts and implement the management strategies rationally. The corn is harvested during the months of June and July on farms that have a 2nd crop. The machines used are the same ones that are used for the harvest of the grains, only changing the platform to gather the ears of corn. The processing and storage of the corn begins with receiving it in the warehouse, followed by the pre-cleaning of the corn, drying, storage and the subsequent shipment of the stored corn. The production cycle of the corn crop begins with the market analysis, which establishes the amount of area to be planted. After this, the fields are defined and all the crop planning and the implementation of the necessary agricultural activities are carried out. Once harvested, the corn grain is stored on the farm to be sold to customers in the domestic and foreign markets. The final destination of the corn is as the main energy component of feed for poultry, pigs and cattle in the meat production process, intended for human consumption. 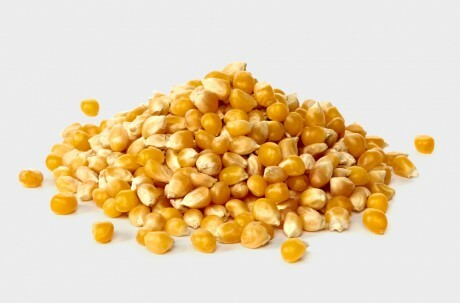 Only a minor portion of the produced volume of corn is used directly in human food, such as flour, oils, sweeteners, pasta, cookies and other foods in which corn is a component. 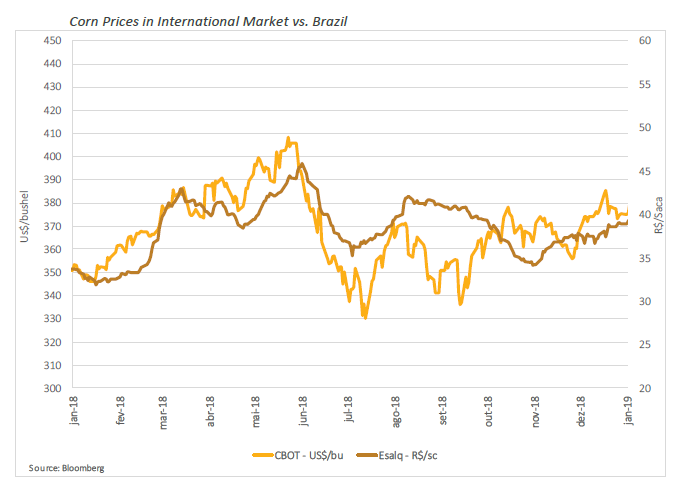 Spot contracts for corn on the CBOT during 2018 traded between 4.00 USD/bu and 3.30 USD/bu. 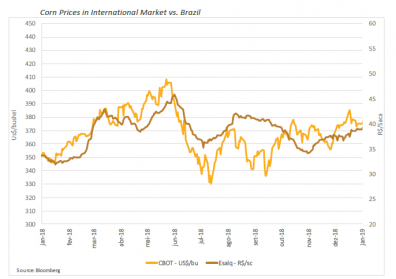 In the current scenario, under which, for the second straight year, global corn consumption is expected to surpass production, prices in global markets should tend to find support. with estimates calling for production in first and second crops combined of over 91 million tons. data, down 17% from the previous crop year, due to the lower yield of second-crop corn. The productivity of the corn grown in the 2nd crop was 9,912 per hectare. The planting of the corn 2nd crop began in the second half of January 2018, as the harvest of early soybean varieties advanced. The areas already planted are well-established and present good vegetative development.